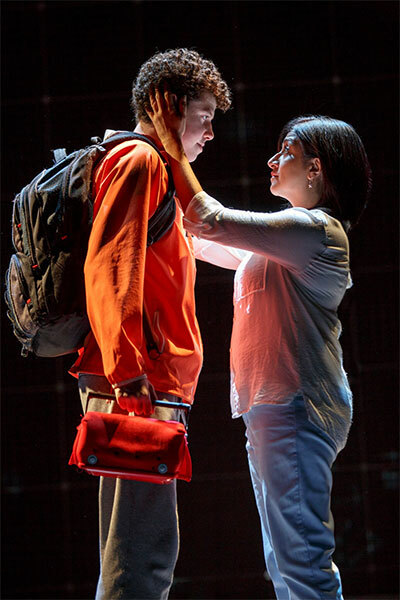 Adam Langdon as Christopher Boone and the touring production of The Curious Incident of the Dog in the Night-Time. Adam Langdon as Christopher Boone. A large dead dog lies motionless on stage, a garden fork skewered into it’s side. 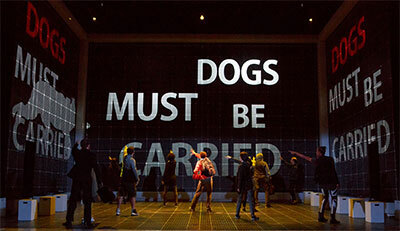 That’s the sight theatergoers see immediately upon taking their seats to witness the first national tour of the wonderfully strange and heartfelt The Curious Incident of the Dog in the Night-Time, now playing at the AT&T Performing Arts Center in Dallas—through Jan 22—before moving south to Houston’s Hobby Center Jan. 24-29. Fifteen-year-old Christopher John Francis Boone is suspected of killing his neighbor’s dog, Wellington. Despite knowing all the countries of the world and their capital cities, he is innocent of the outside world, distrusting of strangers and never ventures alone beyond the end of his road. He decides to turn detective, despite his father’s objections, to solve the murder mystery and details his investigation in a book. Adam Langdon as Christopher Boone and Maria Elena Ramirez as Siobhan. The intrigue here is the character of Christopher apparently has a mild form of autism (although that diagnosis is never mentioned), a boy who doesn’t like to be touched and cannot decipher emotions beyond the tools his teacher has taught him, and so the task requires the huge effort of testing rules and facing his own fears. A literalist by neurology, he deconstructs life into a set of mathematical equations and physical laws. This unique perspective makes him a good detective on one level, where clues and logic rule, but it also fails him on another, higher one because he cannot understand the magnitude of what he uncovers. And those revelations are both hypnotic and heart wrenching in this outstanding production directed assuredly by two-time Tony Award winner Marianne Elliott, who’s magic touch gave War Horse its jolt on stage. 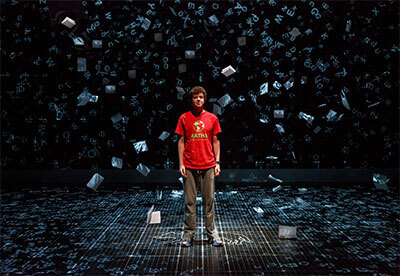 The original National Theatre of London production won the Olivier Award for Best Play in 2013, and then it transferred to Broadway, and won the 2015 Tony for Best Play. It was originally a 2003 bestselling novel by Mark Haddon, who already had a successful career as a writer of children’s books when he embarked on this more adult story. The power of this production goes beyond plot. 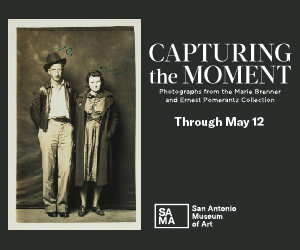 It’s an immersive experience beginning with a literal black box performance space, broken into grids, in which lighting, sound, secret panels, model trains and flashes of screens transport the audience from home to neighborhood to a jaw-dropping subway scene. It’s the perfect playground for Finn Ross’s inspired video projections and Paule Constable’s light show, which at times, with Adrian Sutton’s soundscape, feels like a tidal-wave approach into the wonders and fears of Christopher’s singular mind. But the electronic soundtrack comprising computer bleeps, bloops and glitches is both technically advanced and emotive. As our 15-year-old storytelling sleuth, actor Adam Langdon commands the stage in almost every scene; a twitchy wonder, exhibiting extreme behaviors that scare but also show his vulnerability and curiosity. He is able to spout intricate monologues in what seems like a single breath while trying people’s patience at every turn, a point of empathy for perhaps the most compelling character in the play, Christopher’s father, delicately played by Gene Gillette, whose rough-around-the-edges exterior barely masks a deep love for his only son. As his mysterious mother, Felicity Jones Latta gives a raw performance as a woman conflicted over her role as dutiful mother and wife. 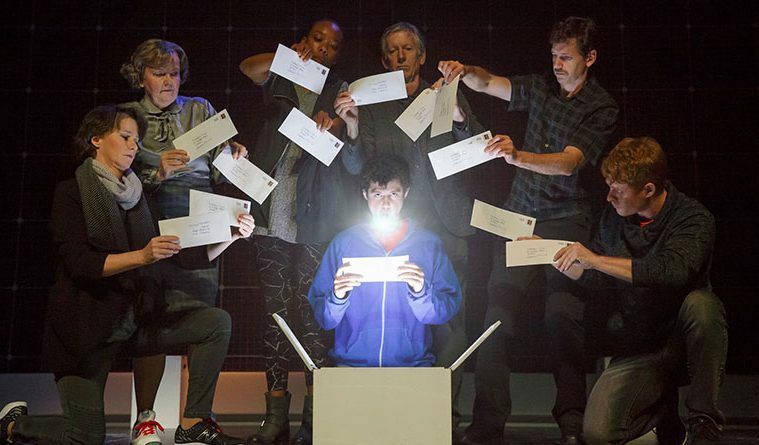 But the standout of The Curious Incident of the Dog in the Night-Time is what’s not on stage. Haddon hasn’t done “Rain Man” stereotyping, nor has he creating a circus freak to entertain us. What we witness is a journey that is truthful and beautiful, in all its rawness and confusion, and how the power of love can often illuminate our darkest fears.